Developed by Atlassian, Jira is a popular tool for software development teams. It comprises several products, including Jira Core, Jira Software, Confluence, and Jira ServiceDesk. All except for the latter can be used for project management. In fact, if your non-development employees have to report bugs for internal software tools, they may be using Jira already. That’s why some companies opt to turn Jira into their primary project management tool, so that everything is easily available in one product. While that idea works, setting up Jira for general project management may take a little more work than other tools. 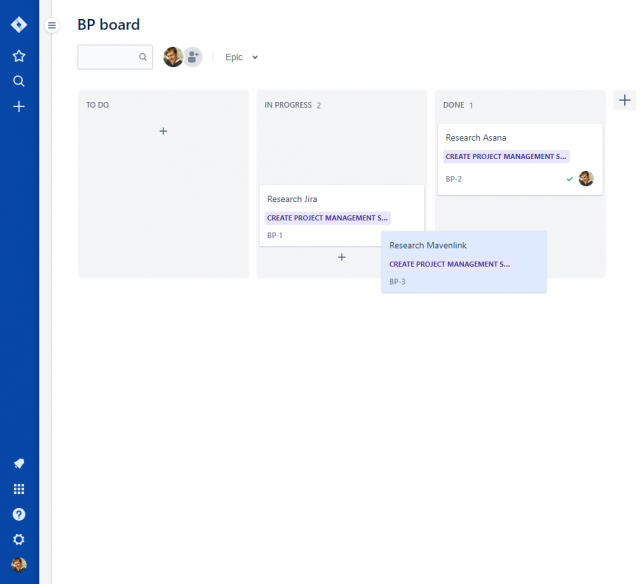 Jira includes some core features that project management software absolutely must have, such as tasks, and a roadmap showing a basic timeline of a project. Then, third-party integrations – such as BigPicture and Atlassian’s own Confluence collaborative workspace – help fill in the gaps. It’s not a perfect solution, but it’s workable, and it may be the most practical option for teams already invested in Jira. Chances are, if you work with software developers of any stripe, you’ve heard the name Jira thrown around. Indeed, Jira is one of the most popular options for software project management among competitors like ClickUp. 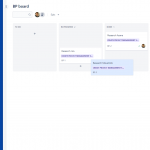 Jira uses the popular Kanban interface, which is more or less akin to a cork board with a bunch of categories, and note cards that you can move between them. It got its start in 2002 under Atlassian, of HipChat fame, and claims a user base of more than 125,000 teams from startups to large enterprises. Unlike other project management tools, Jira is not meant for generic use, and is instead solely focused on software development. However, many teams still rely on it for project management, and use various plugins such as BigPicture and Tempo Timesheets to enhance Jira’s usefulness for non-developers. Atlassian also recommends using Jira together with Confluence, Atlassian’s content collaboration tool. For this review, we’re looking at Jira using its “next-gen” interface, and Confluence. 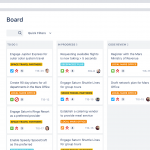 The Kanban board isn’t the only way to assess the progress of tasks in Jira. There is also a Roadmap view, which is akin to Asana’s Timeline view, albeit far simpler. It displays the progress of projects using a weekly, monthly, or quarterly view. It’s not really a calendar, as it only displays days in the weekly view, making it closer to a timeline. Jira integrates with Confluence to provide a number of templates under the Pages tab. Here you can create documents for a variety of purposes, including marketing plans, product launches, and a generic project plan. Again, these options are largely geared towards software teams, but they can be repurposed for other uses. These documents can include helpful features, such as the ability to “at mention” other team members so they’ll see the new documents. Some Pages also have a miniature Roadmap that you can edit to construct a project’s initial schedule right in the document. Jira has its own app store of sorts, where you can integrate with various tools to enhance Jira’s functionality. One such option is BigPicture, which tries to turn Jira into a more traditional project manager. BigPicture comes with an array of features, including a roadmap, a Scope view to see the various project milestones, and Gannt charts to show progress at a glance. . There are nearly 2,000 third-party integrations for Jira itself, and another 874 (at time of writing) for Confluence – not to mention tons of other apps for Atlassian services such as Jira Service Desk and Hipchat. Not all of these integrations will apply to generic project management, as Jira has a software focus. 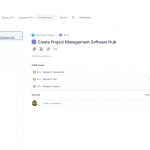 Nevertheless, Jira can integrate with services such as Slack and OneDrive. 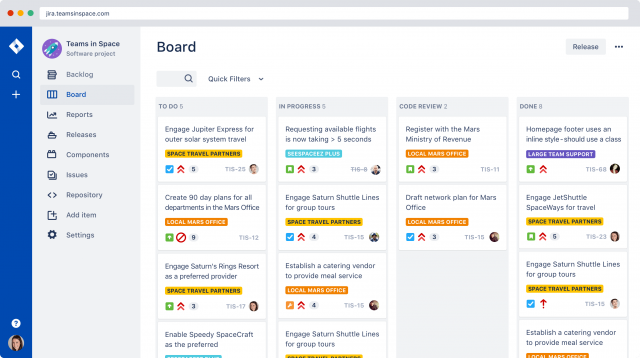 This video from Atlassian highlights the company’s new approach to Kanban boards in their productive project management software, Jira. Jira has numerous pricing tiers, which depend on whether you want to use a cloud subscription. This is where Atlassian takes care of server management, and makes your data available through its data centers. There’s also a server license, where a company can run Jira on its own servers. Cloud subscriptions for smaller teams with up to 10 users cost a flat $10 per month, and includes Jira Core, Jira Software, and Confluence. Up to 100 users costs $7 per user, per month. The next 150 users are $5 per user, per month; finally, up to 5,000 users are $1.10 per user, per month. Annual pricing is the better deal, costing $100 for up to 10 users; 11-15 users will set you back $1,050, and that number goes all the way up to $66,750 per year for 5,000+ users. Jira server licenses offer similar pricing, and can accommodate teams of 10,000 or more. One to 10 users sets you back $10 per year, 51-100 is $8,300 per year, while the 10,000+ tier is priced at $45,500 per year. The Jira interface is very simple, but navigating between Confluence, apps like BigProject, and Jira Software can get a little confusing. 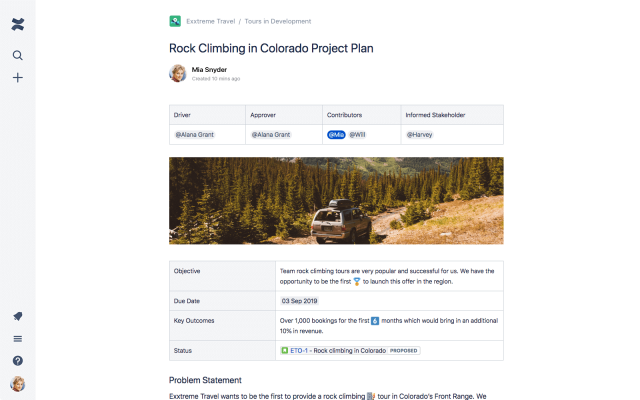 The big attraction for using Jira beyond its simplicity is its scalable pricing structure, and the fact that some teams in your company may already be using Jira – making it an easier tool to transition to. However, if you need advanced project management features – or just want something that’s geared towards general project management – then look elsewhere.